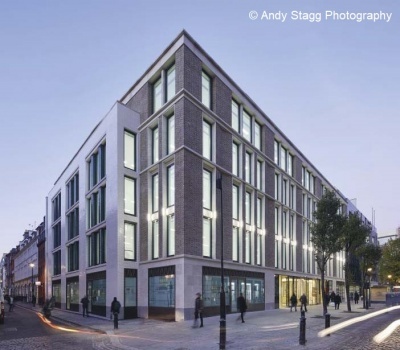 Thirty Broadwick is a new 120,000ft2 building that offers optimised lettable floor areas within Soho’s tight streetscape and replaces a tired building with one that reflects the district’s character. It now offers exemplar West End office space, with large flexible floorplates, that meets the client’s exacting sustainability standards. The upper floors step back, creating large outdoor terraces which provide valuable outdoor amenity space. A deceptively simple project where structural steel is showcased as the ‘go to’ system for maximising the development potential on such heavily constrained sites. Long‐span, column‐free interiors and additional floor area are achieved within planning height constraints determined by a previous consent through innovative deflection control during construction and the inventive integration of structure and services.